After your surgery, you will spend about an hour in the recovery room. Your physical therapist will start you on shoulder exercises the day following your surgery to strengthen and improve the range of motion of your shoulder joint. You will be allowed to perform your daily activities as tolerated, but without lifting objects heavier than a plate or glass while you heal. 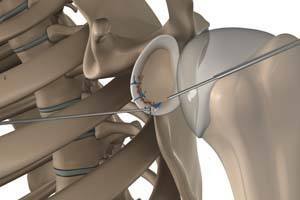 Your arm may be placed in a sling for three weeks to restrict use of your operated shoulder. You may resume light low-risk activities, like jogging and swimming 8 to 10 weeks after surgery, and may be advised to avoid contact sports for some time.